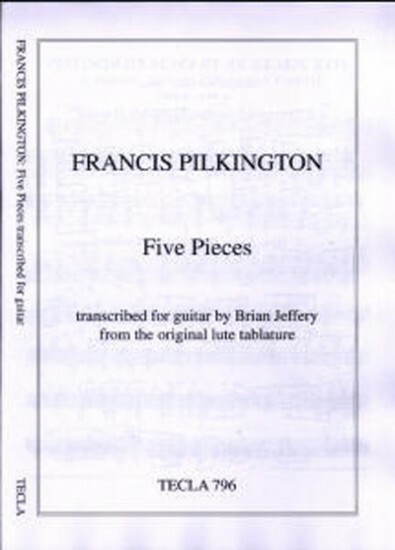 As well as his madrigals and lute songs, Francis Pilkington is known to have written some fifteen lute solos: see his Complete Works for Lute, edited by Brian Jeffery (Oxford University Press, 1970). Five of them are here transcribed for guitar. None of the four dedicatees - Mrs. Elizabeth Murcott, George Pilkington, Mr. T. Wagstaff, Mrs. Anne Harecourt – has been positively identified. Pilkington is known to have had a brother, who may well be the George Pilkington for whom the strange and sad ‘George Pilkington’s Funeral’ was written. The others are likely to have been members of families in Cheshire, where the composer lived and worked. ‘Curranta’ is of course a variant spelling of Coranto, the dance form. In the ‘Content of Desire’, bar 35, second beat, all three treble notes are on the top string in the original, thus losing some polyphony which Pilkington may have intended. The Spanish Pavane differs from the normal pavane form in that it consists of a set of variations associated with a pre-existent bass sequence.